Laser peripheral iridotomy (LPI) is the preferred procedure for treating angle-closure glaucoma caused by relative or absolute pupillary block. LPI eliminates pupillary block by allowing the aqueous to pass directly from the posterior chamber into the anterior chamber, bypassing the pupil. LPI can be performed with an argon laser, with a neodymium:yttrium-aluminum-garnet (Nd:YAG) laser, or, in certain circumstances, with both. In patients with acute angle-closure glaucoma, LPI should be performed after intraocular pressure (IOP) and intraocular inflammation are controlled. The aim is to prevent another attack of acute angle-closure glaucoma or progression to chronic angle-closure glaucoma. In patients with chronic angle-closure glaucoma, IOP may remain the same or be lowered after LPI, depending on the extent of peripheral anterior synechiae. The fellow eye in a patient with acute angle-closure glaucoma or chronic angle-closure glaucoma has a 50% chance of developing acute angle-closure glaucoma. Therefore, if an occludable angle is noted on examination, LPI should be performed. Certain patients, especially hyperopic patients, are at increased risk of having narrow angles. Therefore, gonioscopy should be performed. If narrow/occludable angle is noted on the examination, LPI is recommended. LPI has been performed in phacomorphic glaucoma, aqueous misdirection, and nanophthalmos to relieve pupillary block. In pigmentary dispersion and plateau iris syndrome, LPI is used to confirm the diagnosis. Contraindications for LPI include conditions that cause poor visualization of the iris, angle closure due to synechial closure of the anterior chamber angle, and a patient who is unable to cooperate. 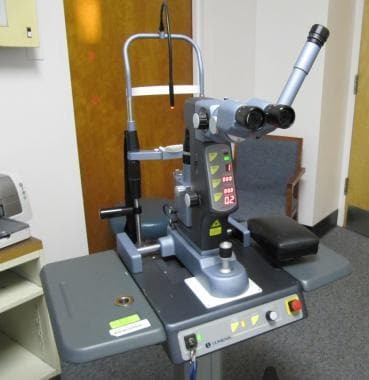 Initially, informed consent for laser peripheral iridotomy (LPI) is obtained. The indications for the procedure (see Introduction), its benefits, and its complications (see Technique) should be discussed in detail with the patient. To perform LPI, a neodymium:yttrium-aluminum-garnet (Nd:YAG) laser (see the first image below), an argon laser (see the second image below), or both are needed. Either an Abraham lens or a Wise lens may be employed. Of the 2, the Abraham lens (see the image below) is more commonly used. It is a modified Goldmann-type fundus lens with a flat glass plate bonded to its anterior surface. 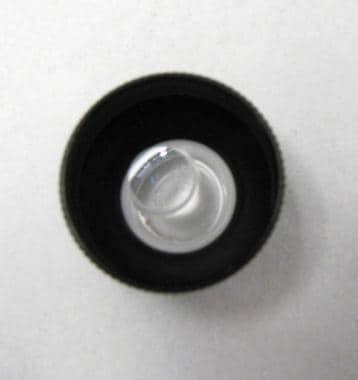 The glass plate has a +66 diopter planoconvex button bonded into a decentered 8-mm hole. The Wise lens has a +102 diopter button, which provides higher magnification. Topical anesthesia with proparacaine 0.5% is usually adequate for performing LPI. The patient must be comfortable at the laser table, as when a patient is examined at the slit lamp. At 1 hour after completion of LPI, the intraocular pressure (IOP) should be checked to make sure that it did not increase significantly (ie, that IOP has not increased by 8 mm Hg or more and that IOP does not exceed 30 mm Hg). Topical prednisolone acetate 1% is given 4 times a day for 5-7 days. AT 1 week, the patient is seen to monitor IOP, to confirm the patency of the iridotomy site, and to check for any significant intraocular inflammation. At 1 month, the patient is seen again for a complete examination that includes IOP measurement, slit-lamp examination, gonioscopy, and dilated fundus examination. IOP is also measured after dilation. If IOP rises by more than 8 mm Hg, the anterior chamber angle is still occludable, and the patient must be evaluated for other causes of angle closure (eg, plateau iris). Before laser peripheral iridotomy (LPI) is performed, intraocular pressure (IOP) and anterior segment inflammation must be controlled. Generally, LPI can be performed with the neodymium:yttrium-aluminum-garnet (Nd:YAG) laser alone. In cases of dark irides, a combination of the argon laser and the Nd:YAG laser works well. The objective is to be able to visualize the anterior capsule. Because postlaser IOP spike is a common complication of LPI, the eye should be pretreated with topical proparacaine, pilocarpine 1%, and either apraclonidine (0.5% or 1%) or brimonidine (0.1%, 0.15%, or 0.2%); the use of apraclonidine or brimonidine significantly reduces the risk of this complication. [4, 5, 6] Pilocarpine is used to stretch the peripheral iris, making it thinner and easier to penetrate. Higher concentrations of pilocarpine are not recommended, because they can cause paradoxical angle closure. LPI is performed as follows. Gonioscopy is used to assess the anterior chamber angle. IOP and intraocular inflammation are controlled. A topical anesthetic (proparacaine 0.5%), a topical alpha-agonist (apraclonidine or brimonidine), and pilocarpine 1% are placed on the eye. The patient is asked to sit comfortably at the laser table. The contact lens is placed on the eye. When the laser is used on the right eye, the contact lens should be held with the left hand, and vice versa. The plane of the contact lens must always be oriented parallel to the iris plane and the laser spot centered within the button. The laser beam should always be in sharp focus. If a corneal opacity develops during LPI, the procedure can be continued by asking the patient to look in a different direction. If the view to the iris is still limited after this maneuver, another site must be chosen. The iridotomy site should be in the peripheral third of the iris just anterior to the arcus. A crypt or a thinned area of the iris is recommended. Most ophthalmologists place the iridotomy between 11 o’clock and 1 o’clock, where it is superiorly covered by the lids. The author, however, prefers using the 3-o’clock or 9-o’clock position. With a nasal or temporal iridotomy site, the view is not limited by the arcus; also, optical aberrations are less frequent than they would be with a superior site. 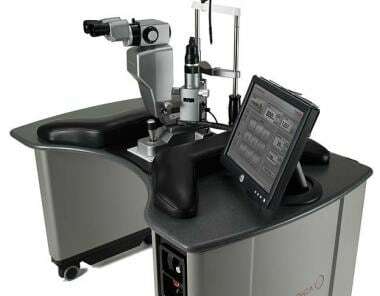 Different laser settings are employed, depending on the device used, the clinical situation, and the physician's preference. The values given below reflect the author's practice and should not be construed as representing rigid guidelines. Recommended laser settings can be broadly divided into 2 groups on the basis of iris color: (1) recommendations for blue or green/light brown irides and (2) recommendations for dark brown irides. In patients with dark brown irides, the iris can be thick. Because the Nd:YAG laser causes photodisruption, significant pigment dispersion, iris bleeding, and possibly hyphema can occur. To prevent these complications, the iris stroma is initially thinned with the argon laser, and the iris pigment epithelium is penetrated with the Nd:YAG laser. The goal is to visualize aqueous following through the iridotomy site with iris pigment release. Additionally, the anterior capsule should be visible. If iris bleeding develops, pressure is applied to the globe with the contact lens (for approximately 10-20 seconds) until the bleeding is stopped. Complications of laser peripheral iridotomy include postoperative IOP spike, intraocular inflammation, iris bleeding and hyphema, focal cataract,  posterior synechiae, visual symptoms (eg, blurred vision, haloes, lines, glare, and diplopia), corneal decompensation, and miscellaneous complications. To prevent postoperative IOP spike, a drop of topical apraclonidine (0.5% or 1%) or brimonidine (0.1%, 0.15%, or 0.2%) is placed on the eye before LPI. The IOP should be checked within an hour after LPI. Anterior segment inflammation is another common complication of LPI. It is thought to be due to the release of prostaglandins. The inflammation is usually mild and can be successfully treated with topical steroids. Prednisolone acetate 1% 4 times a day for 5-7 days is prescribed. Robin AL, Eliassi-Rad B. Laser Iridotomy. Morrison JC, Pollack IP. Glaucoma: Science and Practice. New York, NY: Thieme; 2003. (41)439-445. Lam DSC, Tham CCY, Congdon N. Peripheral iridotomy for angle-closure glaucoma. Shaarawy TM, Sherwood MB, Hitchings RA, Crowston JG. Glaucoma. China: Saunders; 2009. Vol 2: (65)61-69. Abraham RK, Munnerly C. Laser iridotomy. Improved methodology with a new iridotomy lens. Ophthalmology. 1979. 86 (suppl):126. Robin AL, Pollack IP, deFaller JM. Effects of topical ALO 2145 (p-aminoclonidine hydrochloride) on the acute intraocular pressure rise after argon laser iridotomy. Arch Ophthalmol. 1987 Sep. 105(9):1208-11. [Medline]. Rosenberg LF, Krupin T, Ruderman J, et al. Apraclonidine and anterior segment laser surgery. Comparison of 0.5% versus 1.0% apraclonidine for prevention of postoperative intraocular pressure rise. Ophthalmology. 1995 Sep. 102(9):1312-8. [Medline]. Chen TC, Ang RT, Grosskreutz CL, Pasquale LR, Fan JT. Brimonidine 0.2% versus apraclonidine 0.5% for prevention of intraocular pressure elevations after anterior segment laser surgery. Ophthalmology. 2001 Jun. 108(6):1033-8. [Medline]. Fleck BW. How large must an iridotomy be?. Br J Ophthalmol. 1990 Oct. 74(10):583-8. [Medline]. Vijaya L, Asokan R, Panday M, George R. Is prophylactic laser peripheral iridotomy for primary angle closure suspects a risk factor for cataract progression? The Chennai Eye Disease Incidence Study. Br J Ophthalmol. 2017 May. 101 (5):665-670. [Medline]. Moster MR, Schwartz LW, Spaeth GL, et al. Laser iridectomy. A controlled study comparing argon and neodymium: YAG. Ophthalmology. 1986 Jan. 93(1):20-4. [Medline]. Pollack IP, Robin AL, Dragon DM, Green WR, Quigley HA, Murray TG. Use of the neodymium:YAG laser to create iridotomies in monkeys and humans. Trans Am Ophthalmol Soc. 1984. 82:307-28. [Medline]. Krupin T, Stone RA, Cohen BH, Kolker AE, Kass MA. Acute intraocular pressure response to argon laser iridotomy. Ophthalmology. 1985 Jul. 92(7):922-6. [Medline]. Ritch R, Liebmann JM. Laser iridotomy and peripheral iridoplasty. Ritch R, Shields MB, Krupin T. The Glaucomas. 2nd. St. Louis, MO: CV Mosby; 1996. Vol 3: (76)1549-64. McAllister JA, Schwartz LW, Moster M, Spaeth GL. Laser peripheral iridectomy comparing Q-switched neodymium YAG with argon. Trans Ophthalmol Soc U K. 1985. 104 ( Pt 1):67-9. [Medline]. Gilbert CM, Robin AL, Pollack IP. 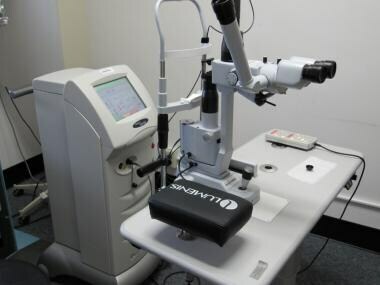 Iridotomy using the Q-switched neodymium (Nd):YAG laser. Ophthalmology. 1984 Sep. 91(9):1123. [Medline]. Lederer CM Jr, Price PK. Posterior synechiae after laser iridectomy. Ann Ophthalmol. 1989 Feb. 21(2):61-4. [Medline]. Spaeth GL, Idowu O, Seligsohn A, et al. The effects of iridotomy size and position on symptoms following laser peripheral iridotomy. J Glaucoma. 2005 Oct. 14(5):364-7. [Medline]. Wishart PK, Sherrard ES, Nagasubramanian S, Kerr Muir MG, Hitchings RA. Corneal endothelial changes following short pulsed laser iridotomy and surgical iridectomy. Trans Ophthalmol Soc U K. 1986. 105 ( Pt 5):541-8. [Medline]. Schwartz AL, Martin NF, Weber PA. Corneal decompensation after argon laser iridectomy. Arch Ophthalmol. 1988 Nov. 106(11):1572-4. [Medline]. Small KM, Maslin KF. Malignant glaucoma following laser iridotomy. Aust N Z J Ophthalmol. 1995 Nov. 23(4):339-41. [Medline]. Obana A, Gohto Y, Ueda N, et al. Retinal and subhyaloid hemorrhage as a complication of laser iridectomy for primary angle-closure glaucoma. Arch Ophthalmol. 2000 Oct. 118(10):1449-51. [Medline]. Corriveau LA, Nasr Y, Fanous S. Choroidal and retinal detachment following argon laser iridotomy. Can J Ophthalmol. 1986 Apr. 21(3):107-8. [Medline]. Anderson JE, Gentile RC, Sidoti PA, Rosen RB. Stage 1 macular hole as a complication of laser iridotomy. Arch Ophthalmol. 2006 Nov. 124(11):1658-60. [Medline]. Srinivasan K, Zebardast N, Krishnamurthy P, Abdul Kader M, Raman GV, Rajendrababu S, et al. Comparison of New Visual Disturbances after Superior versus Nasal/Temporal Laser Peripheral Iridotomy: A Prospective Randomized Trial. Ophthalmology. 2018 Mar. 125 (3):345-351. [Medline]. Baskaran M, Yang E, Trikha S, Kumar RS, Wong HT, He M, et al. Residual Angle Closure One Year After Laser Peripheral Iridotomy in Primary Angle Closure Suspects. Am J Ophthalmol. 2017 Nov. 183:111-117. [Medline].